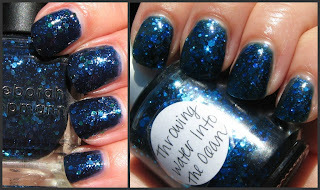 Here's a quick comparison of Deborah Lippmann's Across the Universe with Lynnderella's Throwing Water Into the Ocean. They are definitely similar, but they do have their differences. Both have a dark blue jelly-type base, but AtU is more navy, while TWItO is more of an inky deep teal. I use two thicker coats of Atu, touching up bald spot after the first coat before applying the second coat. TWItO applies best for me using three coats without requiring any touch ups, so similar applications, more or less. *Click pic for larger detail. Macro shots show the glitter colors and configurations. Lippmann's has more green hex pieces than Lynnderella's, and more uniform hex sizes. Lynnderella's has a variety of hex sizes. There's also more micro glitter in the Lippmann shade. The most obvious difference is the prominence of the green hex glitter in the Lippmann polish. The more obvious difference to me is in the base itself. Not the blue color difference as much as the way Lynnderella's polish seems to overlay the glitters. Lippmann's glitter appears to be more on the top surface, while Lynnderella's seems to have more depth to it. 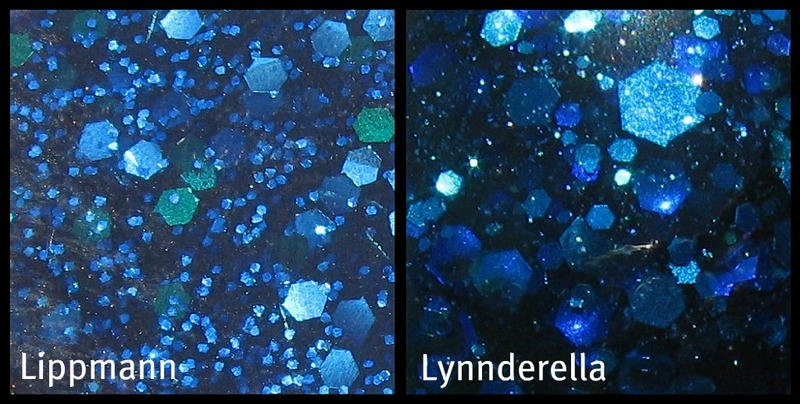 I mentioned earlier that Lynnderella's base reminded me of the Maybelline Waters polishes, and that attribute allows you to see the layers of glitter, with each progressing layer showing more clarity. The do look so much alike. Beautiful.